Pro-Cast desins, manufactures, and delivers a variety of retaining wall systems. We have produced over 1,000,000 square feet of MSE panels. Contact a Pro-Cast representative to help you decide which system best fits your needs- from lagging, MSE, soundwalls, deck panels, and curtain walls to our new L-Wall. The Reinforced Earth Company is a design/supply firm recognized as the inventor and market leader of the Mechanically Stabilized Earth (MSE) retaining wall industry. The company provides retaining wall systems, reflective and absorptive sound walls, precast arches and slope stabilization systems for use in civil engineering applications including transportation, bridges, railways, industrial facilities and marine structures. The Neel Company licenses and provides engineering support for high-tech precast concrete products including the T-WALL ® Retaining Wall System and the IsoGrid ® M.S.E. Wall System. Port-O-Wall Systems LLC is the originator of the patented technology for manufacturing precast steel-reinforced concrete wall sections featuring a Port in the base of the wall panel. 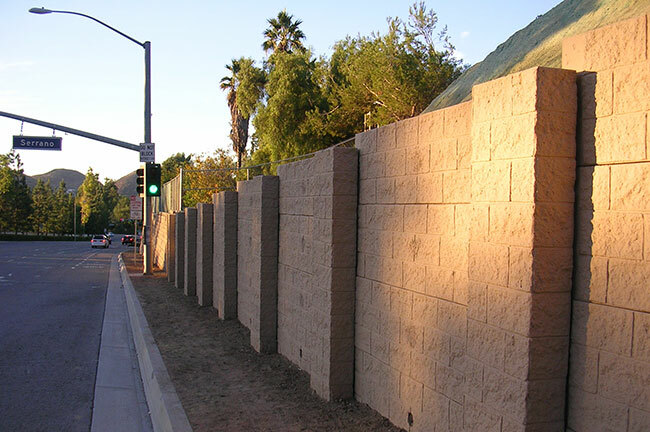 The L-Wall is a Pro-Cast Products' instant retaining wall. L-Wall is designed in a number of wall heights with its own footing and decorative face.